the “phrase once in a lifetime” could not be more true. 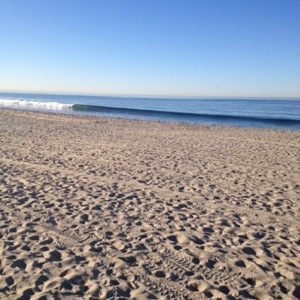 Today for the first time in probably 6 months I stopped by one of my favorite places in the world; The beach. I forget how it can be both energizing and calming at the same time. It was a great way to meditate and just breath a bit. Even though I only was able to get in a little over a mile, I made sure I walked with a good pace keeping my heart rate going. Every mile counts towards my 100byValentines. And getting up and ready a little earlier than I have lately helped me not only jump start my metabolism and get me moving, but I was able to run a few errands prior the rest of my family waking up. I stopped at trader joes, picked up our weekly menu and even a little snack for myself. Because I better than anyone know that feeding myself can sometimes be last on my list. I worry so much about making sure everyone else is taken care of. I miss meals and then end up snacking, cheating on my diet or eating one large unhealthy meal. 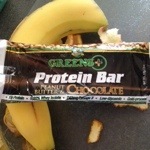 So I grabbed a nutritious protein bar knowin it would hold me over until lunch. 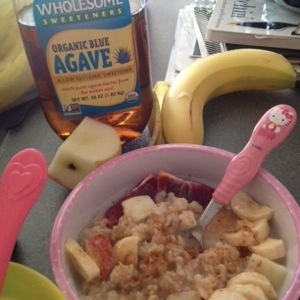 I also made my girls something healthy to start their day. I know that as important it is for me to stay healthy, it’s even more important to keep my kids healthy and on the right track. 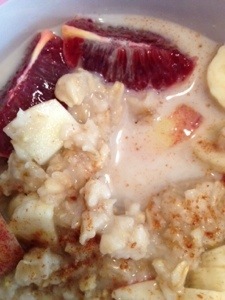 I made some gluten free oats with almond milk, added banana, gala apples, blood oranges, agave nectar, and pumpkin spice… Kid friendly, mother approved!